Custom Golf Scopes Personalized in Bulk. Inexpensive, Promotional. Bulk personalized pocket golf scope. Our handy golf companion provides yardage to ther flag. High Power: 8 x magnification! Black armored roof prism. Boxed. Imprint on case. 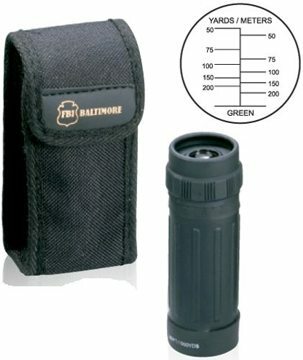 Budget Prices in the USA and Canada for bulk personalized golf scopes. American clients pay no taxes. Contact us to place an order or fill up the Order Form below. Our artwork design is free and we will Email you a proof for your approval before production. We will add the most economical shipping charge by UPS Ground, unless you instruct us otherwise.